Landfolio software for natural resources manages all aspects of the damage compensation process for companies engaging in exploration and extractive activities which may have adverse social and environmental impacts. When exploration and extractive operations are initiated at a new site, the operating company must be aware of and effectively manage potentially adverse social and environmental impacts; this often includes properly compensating affected communities.The direct impact of an operating mine or exploration activity can include damage to buildings and other structures, crops and livestock, and surrounding vegetation and water sources which communities utilize. Compensation is often based on agreements negotiated between the concerned parties, typically the mining company and affected communities. Compensation procedures are designed to ensure a uniform, systematic, and timely method of recording, approving, and paying for damage to property. It is imperative that these companies follow these established procedures—and do so efficiently. 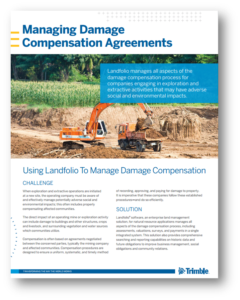 Landfolio® software for natural resources, an enterprise land management solution, manages all aspects of the damage compensation process, including assessments, valuations, surveys, and payments in a single integrated system. This solution also provides comprehensive searching and reporting capabilities on historic data and future obligations to improve business management, social obligations and community relations. Provides a uniform, systematic, and timely method of recording, approving, and compensating for damages to land, crops, trees, livestock, etc. Manages all tasks, within the given time frame, including scheduled meetings, surveys, payments, notifications, etc. Use integrated GIS mapping tools to provide precise localities for all aspects of the compensation agreement including area validations, resettlement plots, graves etc.